Well, it's that time of the year again. 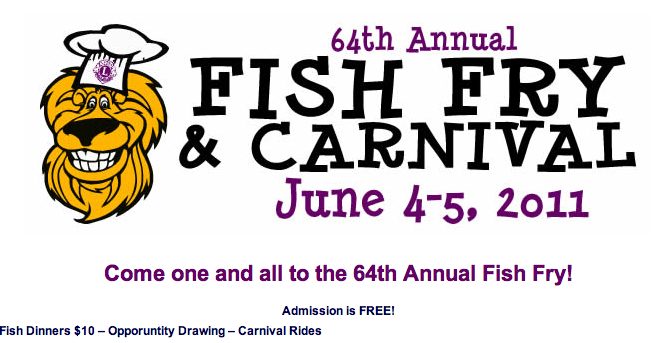 This weekend, June 4th and 5th, is the 64th annual Costa Mesa Newport Harbor Lions Club Fish Fry. The carnival rides open on Friday, June 3rd, from 6 p.m. - 10 p.m. 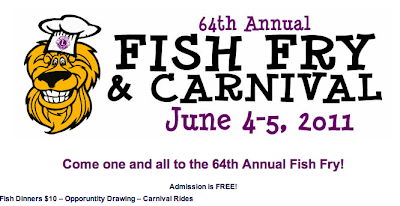 The Fish Fry opens on Saturday and Sunday at 11 a.m. For more information visit the web site HERE. 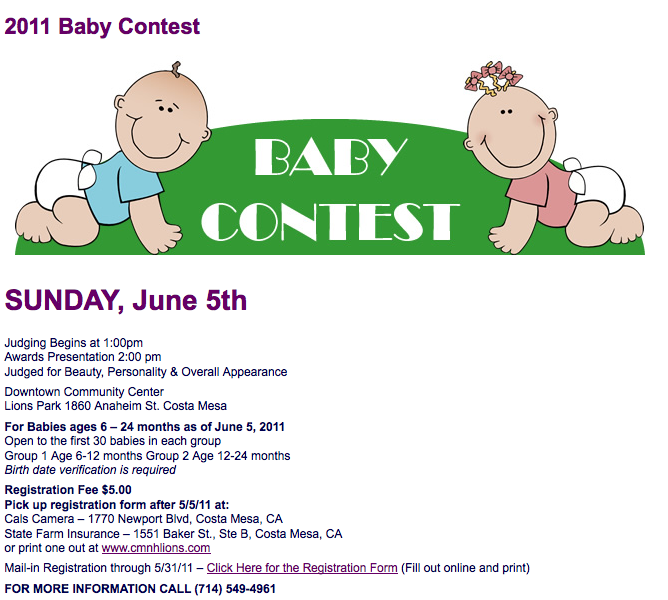 The Baby Contest will be held from 2 p.m. - 3 p.m. Sunday. 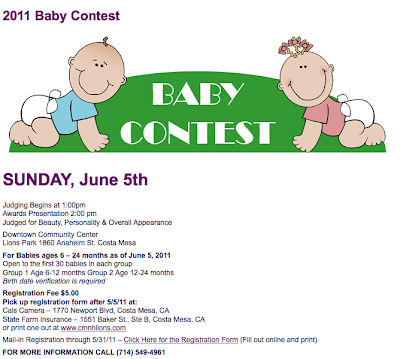 Rules for entry can be found HERE. Some of the comments on yesterday's post, to the effect that public sector employees should suffer because private sector employees do, reminds me of an old Russian joke: A farmer frees a genie from a curse and is granted one wish. He tells the genie, "My neighbor has two cows, and I have none." The genie replies, "So you want to have two cows also?" "No," says the farmer, "I wish that both his cows would get sick and die." The Grover Norquists of the world must be dancing in glee, as they drown American democracy in the bathtub, using the tactic of divide and conquer to set private sector employees against public workers. Eleanor, Must be nice to live off the public dole. If you die before Tom does he get to keep your Pension and Medical Benefits? Private sector employees vent issues at the water cooler and coffee pots, this informations goes to the top or the bottom line. Either way, issues are delt with. Ceo's and mid management and employees are let go. The public sector employee is stuck with the flavor of the month, politician elected or not, pushing their self imposed importance, flashing badges that weren't earned, pushing people around as the employees hope they can hold their collective breath until the next election is over. This too will pass they say, the question how much carnage in the wake and for what ends. In response to the anonymous responder to my comment: Thank you for so aptly illustrating the point I made about the Russian farmer. Some private sector workers are so full of resentment they would rather take away the retirement security that public sector workers have earned than try to get the same for themselves. They allow themselves to be divided and conquered. An earned pension is not “the public dole.” It is an annuity paid for with my labor over the years, both by accepting lower wages than I could have earned in the private sector and by having payroll deductions from my pay. (Yes, I did turn down more lucrative offers from private firms, partly because I liked working for the public and partly for the retirement security. No, the pension is not a lot of money; less than $35,000 a year before taxes are taken out. Unlike City Council members, I do not receive any medical benefits.) My pension is not in jeopardy, because it is vested. It is a debt owed to me by the California Public Employees Retirement System (CALPERS), just like my paychecks when I was working. I have been attending City Council meetings and study session because I am invested in this city. It is my home, and I care about its future. It pains me to see Costa Mesa destroyed to advance a political agenda. What do these comments have to do with the Fish Fry? Eleanor: I am sorry. You are right, you earned it. I guess I had to blame someone because I chose the wrong employment line when choosing a career. I guess I am just jealous because I have to live in a motor home and try and find work at Lion's Park. I am sincerely sorry. You know, I'm a pretty tolerant guy here and permit most of you to vent your spleens. That doesn't mean I like it, but I want this to be a platform for constructive discussion of important issues, even though it sometimes deteriorates to just so much blather. I was offended for Eleanor when made your inappropriate remarks and I'm glad she set you straight. She's not only a former employee of this city - who served it with distinction - but has been a tireless volunteer for more than a decade, including a term on the Planning Commission, where her wisdom, logic and calm demeanor made her a very effective commissioner. She was among those who launched the movement to "improve" the Westside. Cut her some slack unless you've got something worthwhile to debate with her. ...Dole, apology accepted. I'm sorry you are having a tough time, and I wish you well. Geoff, thank you for your kind words. I'm so glad you are part of the Costa Mesa community!